There is a lot of psychology behind why so many people fear their finances. I’ve often wondered if it stems from the pervasive “I hate math” beliefs that perpetuate our society. Working with money means working with numbers, therefore it must be scary. Money management and finances shouldn’t be scary. Like any skill it simply takes some training, work, and dedication. 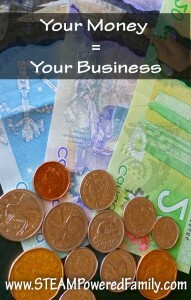 Your family finances are simply your small business. It is the small business of your life. You wouldn’t start a small business without ensuring you had the right people helping you and had the proper knowledge… would you? Your finances are no different. One of the first things people should do is take a realistic look at their finances. This means tracking your spending, savings, and debt. If you don’t know where your money is going you can’t make informed decisions. Lots of banks offer complimentary spending trackers. Check to see if yours does. If not, a simple spreadsheet is enough. You don’t need to put every penny in, but track the big stuff. At the end of the month you can see how much is “missing” and going to the little things (brace yourself, that number can be really scary). It isn’t just about saving, saving, saving. It is also about realistic, responsible and thought out spending. A house may cost quite a lot of money, but paying rent every month may not be right for you, or a cheaper house may result in a nightmare commute. At the end of the day it is about balance and trying to make the right decision to meet all your needs. Mistakes can be corrected and you can learn and come back from those mistakes, but like any business it is going to take work and time. Take responsibility. It is so easy to lay blame or to make excuses. Own your decisions. If you really think you need that boat, then have the boat, but know how that decision will fit into the rest of your plan. Perhaps the boat comes at the expense of a winter vacation or your early retirement dreams. Set goals! Once I started tracking our monthly spending habits I realized we were spending a LOT of money on food. Just being aware of that I was able to make a few small changes (ie. meal planning) which reduced our monthly food spending by 30%. If you miss a goal, don’t panic. Set a new one. Like anything, there are going to be setbacks, there are going to be challenges, but that doesn’t mean you should quit. Learn from it and move on. Grow your business. Learn from others. Whether it is a financial consultant, research, reading books on finances, or a friend who is “getting it right”, learn from them. The more knowledge you have, the more capable you will become in handling your money. Finally, if you have kids, teach them about finances. Schools don’t really teach money management and the time to start saving is when you are young, with minimal financial commitments. Compound interest is a beautiful thing. Make sure your kids understand concepts like earnings, savings, interest, debt, mortgages, and more. Of all the math we learn in school, this application of math is the most important and most rewarding. It’s your money = your business, make it a successful one! Previous Post: « Homemade Veggie Stock – Cut the waste! Have you come across YNAB (You Need A Budget)? It is a fabulous approach to money management with a dedicated piece of software and a very supportive forum. It’s changed my relationship to money for the better, and I think would be a great way to introduce children to the idea of budgeting. I wish I’d had it years ago, but I’m so glad I have it now because you’re right, managing your money is a key part of life. Thanks for the suggestion, I will have to check it out! This is a great post and you make some really good points! I definitely need to track my monthly spending better…thanks for the reminder. So glad you linked up with Share The Wealth Sunday this week!